In another of her posts on policing, Kath Murray comments on police officer statistics. Recently, the Sunday Herald published an article on police officers numbers in Scotland. This suggested that the number of front-line officers available for duty, was around 10,000. This is a good deal lower than the 17,000 plus figure regularly cited by the Scottish Government, by dint of its policy commitment to maintaining 1,000 more officers than in 2007. On the one hand, as the article explained, some of the discrepancy can be legitimately explained. On the other hand, it appears to be a huge shortfall, which raises serious questions in relation to transparency around police officers numbers in Scotland. To be clear, as Jack Greig-Midlane shows in this excellent blog (which deftly unpacks David Cameron’s recent claim that there has been a five-fold increase in neighbourhood officers) these data are not immune to political shenanigans. Nonetheless, the fact that he is in a position to take the data apart differentiates England and Wales from Scotland. 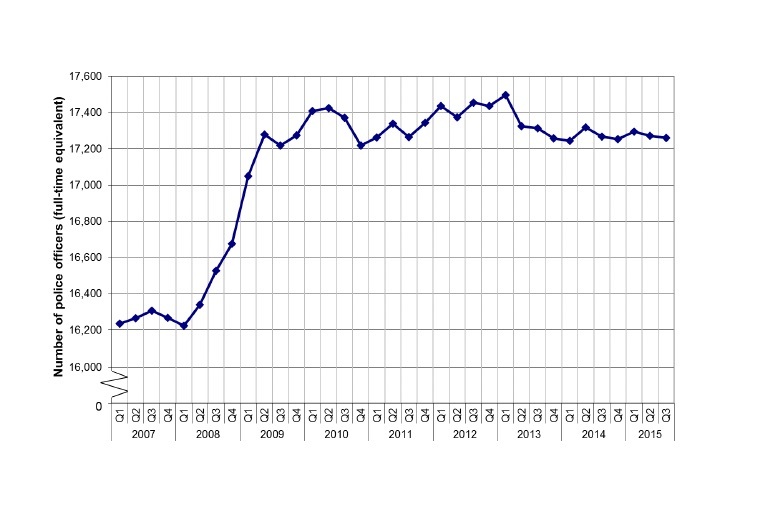 In Scotland, the Scottish Government publish data on the total number of police officers over time (shown above)* whilst Police Scotland publish a breakdown by Division. No other data are available. On asking for a breakdown by rank, Police Scotland advised the Sunday Herald to submit a Freedom of Information request. I’d suggest that this discrepancy between the two jurisdictions needs to be addressed. Police officer strength is a flagship Scottish Government policy, yet there’s no meaningful data available to support this. Of course, there may a strong case for maintaining an additional 1,000 police officers, rather than say, a 1,000 extra care workers. However, this needs to be credible, evidence-based and take into account the overall cut in the police budget. The case should also clearly map out how police officer and staff resources in Scotland are deployed. Dr Kath Murray is a criminal justice researcher at the University of Edinburgh.